This photo definitely includes my grandfather, Denis Kunkel (second left, second back row) and was found as a backing board behind another picture. 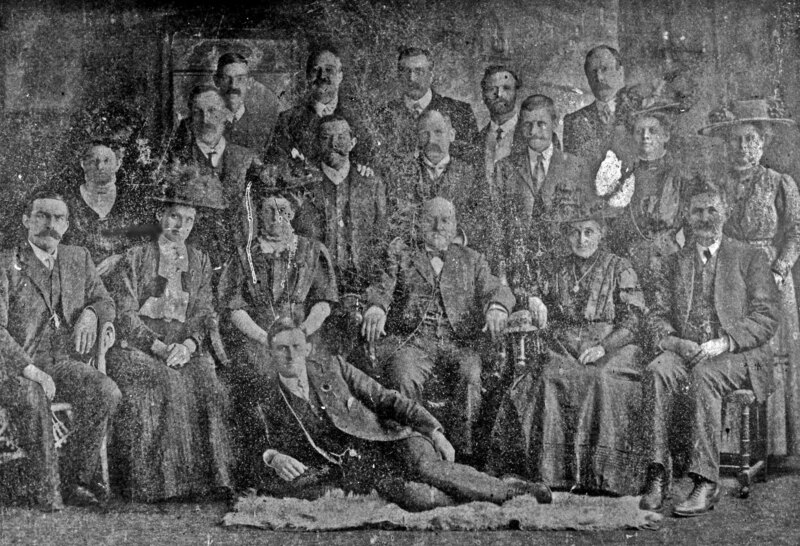 I have a theory it is be an extended family photo because of some of the poses and family resemblances-some look very like my father. Or it could be some local society -but less likely as it includes women. It was probably taken in the Toowoomba area circa 1917. If anyone thinks they recognise someone in this picture I would LOVE to hear from you. The most likely family names are Kunkel and Gavin (from Pechey). (Click on the photo to enlarge it). This entry was posted in Brickwall, Darling Downs, Family History, Gavin Family Queensland, Kunkel Family History, Local History, Murphy's Creek and tagged brickwall, Crows Nest, Gavin, Kunkel, Pechey, Toowoomba by cassmob. Bookmark the permalink. Just letting you know have taken down my blog. My uncle Gavin Coman, dads brother passed away. Will start again on FB pages. I am returning to France and Europe ( Switzerland , Spain etc) at xmas. Was going to Egypt for a month for WW1 research but too risky. Also off to Somme again April 14, UK with my girls end 2014 then Gallipoli 2015 and Fromelles Anniversary 16. Hoping to do just WW1 Somme for a month or so in 17. So i better start researching frantically. So much info from friends on Somme and uni professors. Thanks Louise. Sounds like you have lots of adventures and research ahead of you.